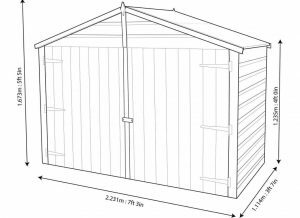 The Blooma Shiplap Wooden Bike Shed is just as good for storing your gardening items, kids toys and a whole bunch of other items as it is keeping your bikes safe from thieves and out of the rain. 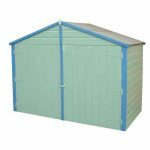 It is strong and sturdy as it is made out of hard wearing and long lasting wood with shiplap tongue & groove cladding which really does have a fantastic look. 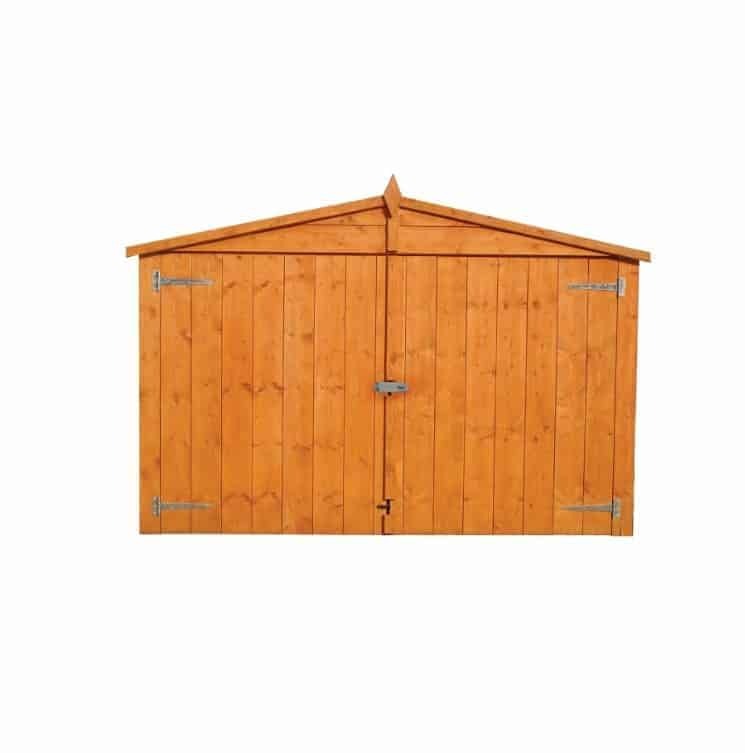 There are large and wide double doors for easy access which will make putting your bike away something that causes you no problems at all. 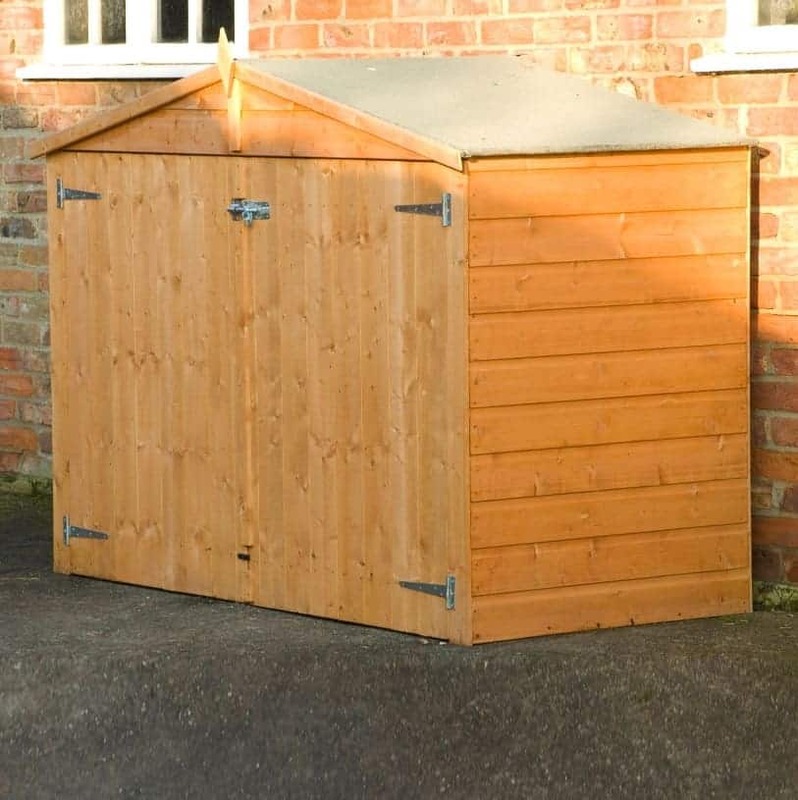 A very stylish looking apex style roof will keep the items inside safe from the rain. 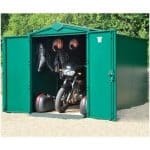 While this is one of the more low cost bike storage solutions that is on the market it is also made to a very high standard. 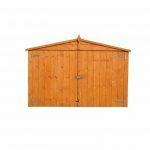 To go with the impressively strong tongue and groove shiplap cladding, Blooma have used a very sturdy frame to keep this a strong structure for many years. 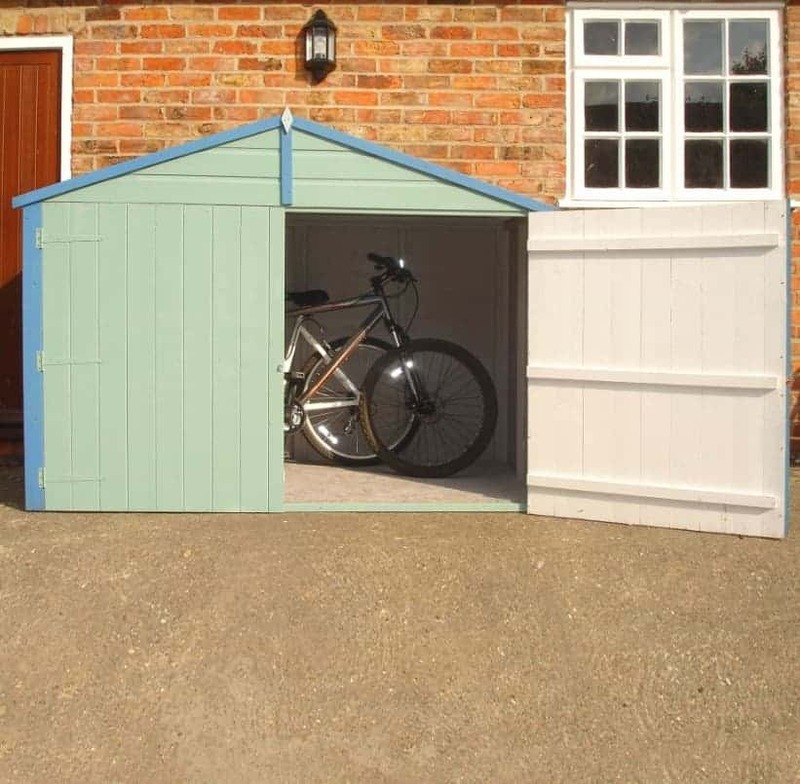 The roof and flooring are both made with solid sheet boarding which are strong, but can be used without the having to raise the price of the bike store. 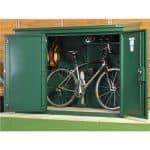 In all this is one very well made and very affordable way to keep your bikes or other items safe. 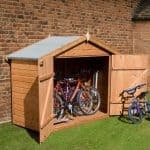 The 7X3 Shiplap Wooden Bike Store is one of the more high quality, low price bike stores that we have seen recently and the rather compact size and interesting design means that it can give you a place to keep your bike safe or even be something that is used for general storage and not take up a whole lot of space. The bike store is 6 feet 9 inches wide and 3 feet 3 inches deep. We understand that this does not sound all that large, but actually this is enough space where you could fit in three adult sized bikes and some gardening items as well. or even if you were to use this as a place for general storage, you would actually have a fair bit of storage space to make use of. It is not the highest store we have ever seen, standing at 5 feet 4 inches, but this is not the kind of structure that is made for you to be pottering around in so we will forgive it for not being over 6 feet high. The apex roof on the bike store is made with solid sheet boarding and covered with felt. This is the standard for a bike store and to be honest we have no complaints with this at all. 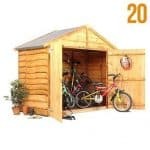 This roof is going to keep your bikes or other items safe from the rain and we love how the roof is angled so that the rain will not run off the roof where the door is. This means after a hard day of biking if it is pouring down with rain, you do not have to then deal with rain running off the roof onto your head. The cladding is perhaps the most surprising aspect of this bike store and we mean surprising in a good way. 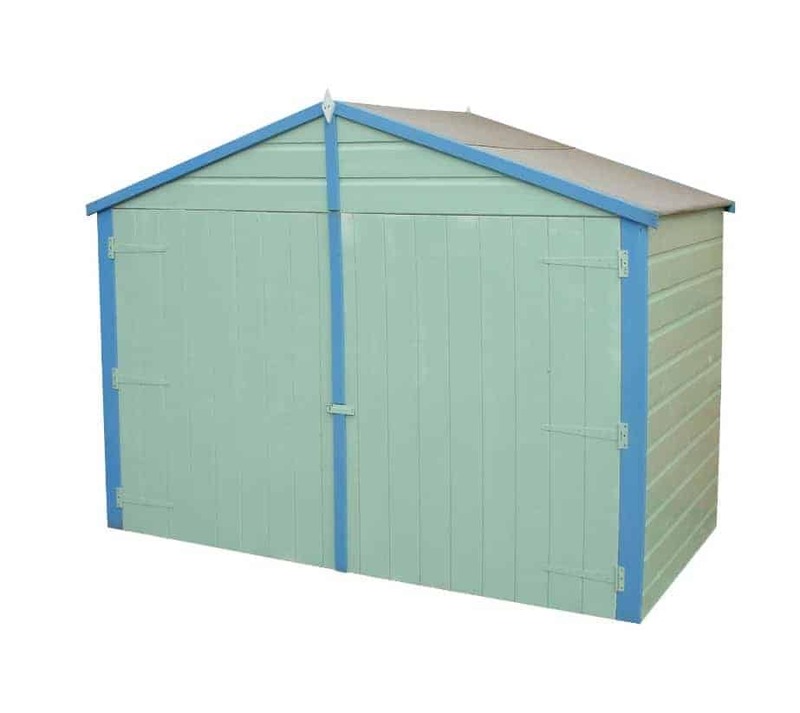 You see even though this is very much so a budget priced bike store, Blooma have somehow managed to still use high quality, tongue and groove shiplap cladding which is going to stand up against the rain and keep the things you have inside of here safe from the rain. While it is very practical, we must say that this cladding also gives it a very classy and high quality look. While Blooma have not come out and exactly said what kind of frame they have used in this bike store, we have eyes like a hawk and we can see that inside of here is a very well made frame that is not too chunky so that it gets in the way, but it is robust enough that it is going to keep this as one very sturdy structure, even when the kids just throw their bikes inside here. Like the roof, solid sheet boarding has been used for the floor. On a budget structure we have no problems with this whatsoever. It is going to be able to take the weight of a number of different items and it also is one of the reasons that they are able to sell this for such a fantastic price. The 7X3 Shiplap Wooden Bike Store will be given a basecoat treatment and this covers all of the wood and will keep it free from rot in the short term. For long term protection it is down to you to get a tub of wood treatment and then give the bike store a generous coating. This is something that should be done each year to keep the wood free from rot. You will be given a ten year guarantee with this which becomes valid once you have applied treatment to the wood. As this is primarily made for storing bikes, Blooma have made sure to put a set of large double doors on this. These doors cover the majority of the front of the bike store and we really like how they make it so easy to get a bike in here. These doors are so large that there is no playing Tetris with your bike trying to get it inside. You just pick it up and place it right in the store without any hassle. Each of the doors is held in place with three strong hinges which are going to prevent sagging from happening. In all we really like this door it is practical and it also has a great look to it. As bike storage is what this is all about, Blooma made the very wise decision to not include any windows on the bike store. A hasp and staple is included so you are going to be able to keep the door shut once you have stored you bike or other items in here, but if you actually want to lock this up a bit more securely then we would highly recommend you purchase a cheap padlock. Thanks to there being no windows it is impossible for a bike thief to look inside here when the doors are shut. The last thing you want to be doing is advertising your bikes so the lack of windows is a real positive feature of this bike store in our opinion. Blooma are not offering any ways for you to alter the designs of this bike store and honestly we are fine with that. However if you do want to change things up a little bit then you could do something that is a little more understated like using a darker wood treatment or you could go all out and use a bright paint and coat it in that. No extras are offered with this, but like we said before, we do suggest you think about picking up a padlock for that extra security. As this can be done for as little as a pound, we do not see this as something to knock the bike store for, but at the same time as a padlock is so cheap they could have thrown one in. Even though this is low priced we are very pleased with the overall quality of the bike store. 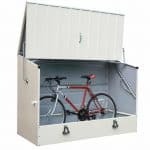 You are going to be able to use this for many years and even if you fall out of love with cycling, you will still have a storage space that can be used for many other items. Just make sure you give this a coating of wood treatment and you will never have any trouble with this. We know that 7 x 3 may not sound all that impressive, but you are going to be able to easily fit in three adults sized bikes in here. With the help of a friend, this should take you 4-6 hours, depending on your DIY skills and how many snack breaks you take. The value for money that this is offering is just incredible. No matter what you use this for, be it bikes or just general storage, you are getting a very good product here at a lot cost. 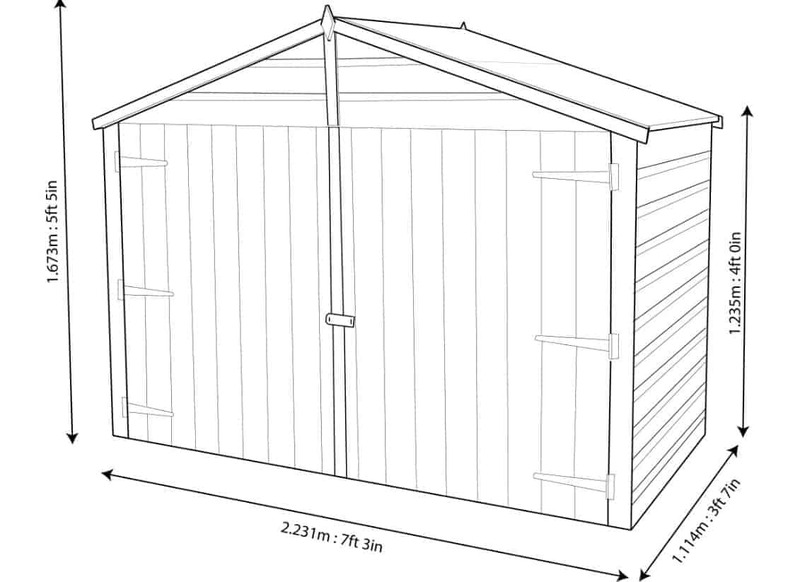 Final Thoughts: The Blooma Shiplap Wooden Bike Shed shows just how good Blooma are at making low cost places for storage. The price is most likely what is going to grab people’s attention at first, but once they take a closer look we are sure they like we were will be amazed at the overall quality of this bike store. The fact that this is actually very easy on the eyes as well makes this something that is just so easy for us to recommend to you. 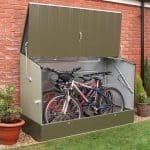 To keep your bikes safe from thieves and the weather this is just perfect and even for a little bit of extra storage it would work wonders as well. 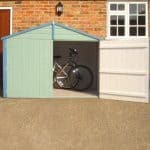 I have been wanting to get a bike shed for a while now. I didn’t like leaving my bikes out. I knew the rust that was going to quickly accumulate on the bikes if I didn’t do something about it. I love this shed because it is anti rot for at least 10 years, and I believe it because the material is so durable. I love everything about it. My bikes fit in nicely. I wouldn’t be able to store anything else, but that is fine because that is not what I bought this for. 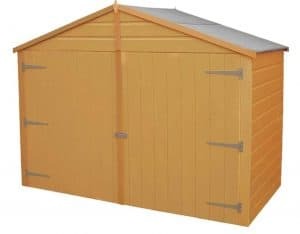 The smart apex style roof was one of the things that stood out to me when I was deciding which bike shed I wanted to get. I went to many different websites before I found one just like this one. I am picky and glad I came across this bike shed.